We grabbed our burgers and left. A little while later Laz asks me if I want to stop at Clearwater Aquarium. At this point, I'm not 100% sure-I was sad about leaving & felt like just being home to calculate & come up with good, concrete reasons to move to Florida. On the other hand, I really wasn't looking forward to being back in NJ, so I began to look up ticket prices and told him "Let's Go!" 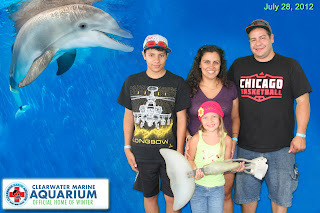 I bought the tickets online and 4 hours later, we were pulling into the Clearwater Aquarium! SURPRISE KIDS!!! SURPRISE KAITLYN!!! Kaitlyn has been wanting to visit the Clearwater Marine Aquarium ever since she saw the movie Dolphin Tale. She swears that she wants to work with dolphins when she's older, LOL!! Touching anything she is allowed to! Here is Winter!!! She had the prosthetic tail on when we first saw her, then the trainers removed it! Here is Winter again, getting a belly rub! So cute! Time to see some of the other CMA residents=Otters first! Rufus!!! These are the pelicans that played the role of 'Rufus' in the Dolphin Tale movie. We didn't leave here until she got a chance to touch one. I touched one too, they were slimy, but it was cool! Then we went to see another CMA resident, Nicholas the only male dolphin here! He was cute too, what dolphin isn't? Anyway, this one has sunburn scars on his back :( poor thing-he was found with his mom when he was a few months old-his mom died and he got sunburn. When this show was over, we walked around a bit more while we waited for the 2pm boat ride to the Winter's Dolphin Tale Adventure, which was in another facility in Downtown Clearwater. You have 2 options to get there without using your own car: trolley or boat! We opted for the boat! This was the boat you see in the movie! I think we all enjoyed the boat ride, except that it was so hot out!! OMG, it really was hot so we decided that we would take the trolley back to CMA! Now we arrive at WDTA, and admission is free with paid admission to CMA. Everything here is about the movie.....props, information, hurricane experience. This stop at CMA set us back several hours, but it was worth it!! The aquarium is small since its not your normal tourist aquarium, this is a marine hospital and they are always on call for any rescues that may arise. So we are back on the road, and around 10pm we are a few miles away from the border of South Carolina, in Pooler, GA and I was tired and convinced Laz to stop for the night so we grabbed food and checked into the Magnolia Inn for the night. At 6am we were eating enjoying some free breakfast at the hotel, we checked out and were on the road again by 7am! Thanks to the awful bumper to bumper traffic in VA, MD and NJ-we didn't get home until 10pm!! Ugh, what a bittersweet moment arriving at the house--glad to be in my own bed but so depressed about being back in WNY, NJ! !